Fresh from NAIA Terminal, I immediately ran to the bus terminal at 3:00 am (Jac Liner) in Cubao Quezon City bound for Lucena. With a Php 135.00 fair, we found ourselves crossing San Pablo City in Laguna, enduring a three hour bus ride. To get to Lake Yambo, we needed to cross the town of Nagcarlan to reach the other side of San Pablo where the target lake is located. We negotiated with a tricycle driver to take us to Yambo but it was an unfortunate day when the driver confessed that he doesn’t really know where Yambo is. Sad, we were already at least 15 kilometers away from the city and he left us in the middle of nowhere. 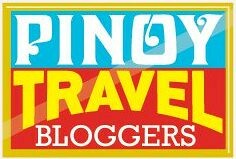 At the highway of nowhere, we learned that there are jeepneys that travel directly to Nagcarlan. (Actually, we weren’t thinking straight that day). Luckily , one jeep passed by and we hopped in immediately and carefully requested to the driver to drop us where we can take a tricycle that will take us to the sought after lake.We alighted near the Municipal Hall of Nagcarlan and from there we finally had the right and honest driver that led us to Lake Yambo. The fare was Php 30.00 each. Carrying our heavy baggage we reached the isolated community of San Lorenzo. 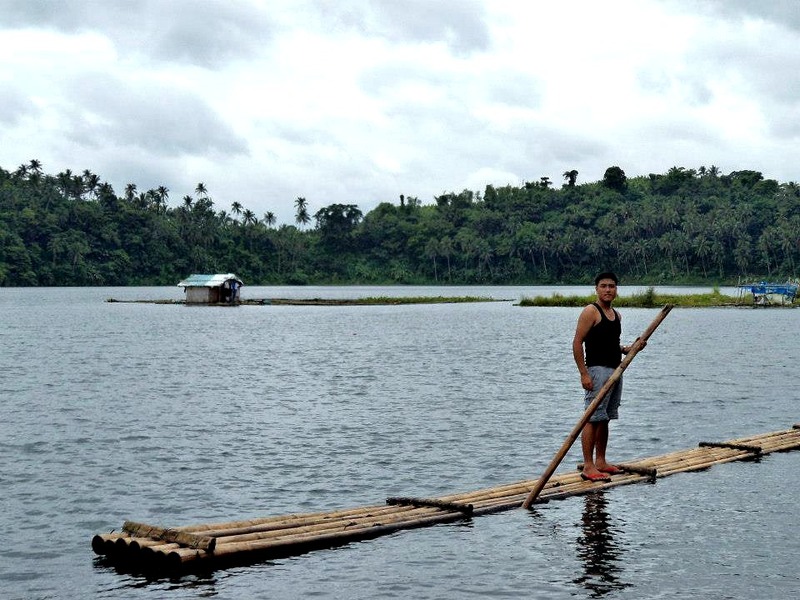 There are no resorts or accommodation in Lake Yambo and the only structure standing or should I say floating along the shore of the lake is a cottage made of bamboo and nipa and an improvised bamboo raft that is being used by the locals in crossing the lake and for fishing at the same. We were supposed to ask for permission from the caretaker but "Manong" wasn’t around so we took the pleasure of letting ourselves in inside the compound.. It was my first time to lay my eyes on the twin lakes (Pandin is on the other side) separated only by a small strip of land. The lake has an approximately 28.5 hectares of surface area. 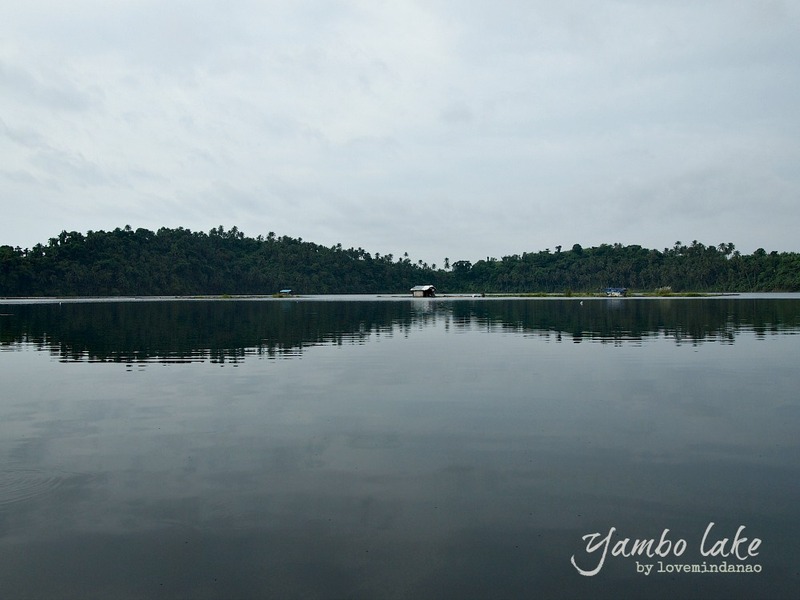 The lake is oligotrophic or a newly developed water body free from pollution and suitable for swimming and fishing. The legend of the lakes, Pandin and Yambo resonates back when I was in high school. According to the tale there were a beautiful lady named Pandin who was cursed by a witch not to step into the earth or else it would be the end of her life. Pandin has an admirer, Yambo, which soon became her lover. Yambo was not aware of the curse and enticed Pandin to step outside her house, stepping into the earth. Lightning and ear breaking thunders chopped the sky followed by grumbling of the earth where the lovers fell and never came back. Heavy rain followed filling the huge earth depressions forming the twin lakes exactly where the two lovers lost their existence. The view in the area was simply relaxing and breathe taking and very much inviting for everyone to just lie down on the cool bamboo floor. Since I am useless in the kitchen, Marvin took in charge of cooking for our breakfast, lunch and dinner and so forth and so on. Surprisingly, I have never expected that my companions brought their “kitchen” in their bags, bringing all the usual cooking utensils ranging from stoves, casserole, frying pan and much much more. That was a strange preparation for “mountaineer people” carrying a lot of stuff for a two day trip. Anyway at least I am not the one carrying the heavy baggage, so never mind. 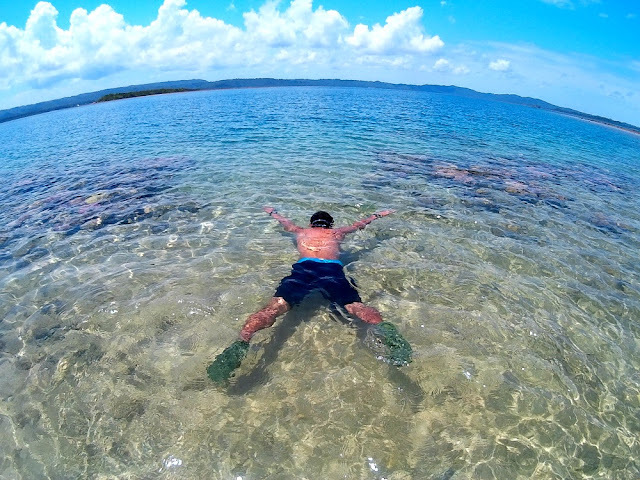 While the master chef, Marvin was so busy preparing our food for the entire day –believe me that was all he did all day long- we took a quick dip into the cool refreshing water of Yambo. The water is so clear that you can almost see the bottom of the lake, feasting on freshwater fishes swimming freely right beneath you. We took the opportunity to use the long bamboo raft parked on the side of the cottage. 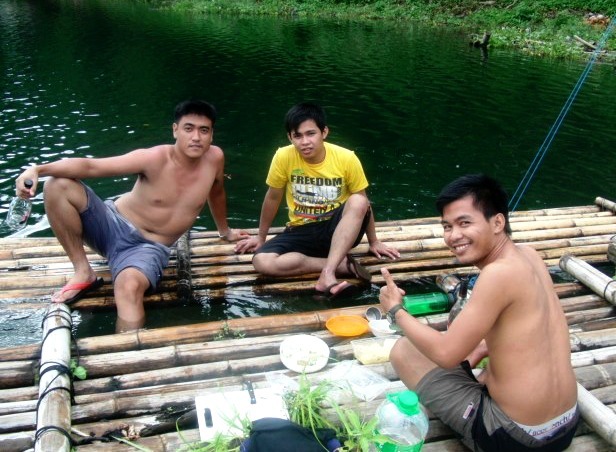 Using a long bamboo pole and a midrib of coconut leaves, we paddled around the lake in a matter of less than an hour. It was scary decision at first, thinking that if you fell into the deep clear water and if you don’t know how to swim, there is no chance for you to survive. The whole lake was completely deserted and the couple of fish pen in the middle of the lake was barely visited. It was a smart move from Strong to bring his life jacket that made them not missed the fun of rafting. In my case I don’t need one because I know how to swim or float at least. With a little kick of alcohol we did the most terrible acts of the night. Most of us were already dancing with the influence of alcohol and the naughtiness was heard endless. Good thing I managed to keep myself tact and a little bit away from the cup. Enough Strong ! Time to sleep! Laughter and laud stories echoed and sparkled in the pitch dark night. With a little light from the crescent moon that had shun upon us, we enjoyed more of seemed unlimited drinks, “papaitan” and the unforgettable “dinamita”- a long chilli pepper with cheese , wrapped in lumpia wrapper then deep fried. 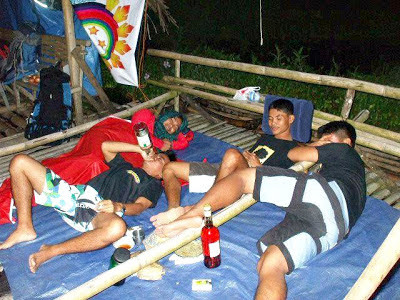 Out of drunkenness, Kurt and the gang carelessly dared roaming the lake using the bamboo raft without any flashlight on hand. Since the night was as black as ink, they had a hard time finding their way back to the cottage and took them more than an hour to return. They vanished from the sight of the lake and all I could hear was their shouting out of drunkenness. They returned all wet making them longing for more liquor to kill the chill. And I just couldn't believe that the drinking session continued. 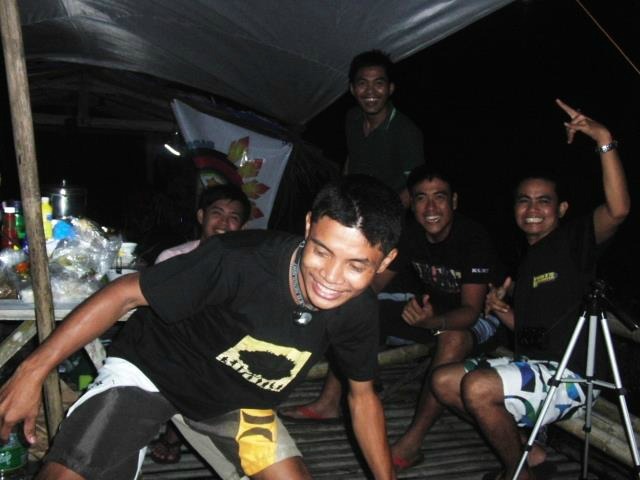 The event that night resembled to the APO HIKING Society song "Awit ng Barkada" (song of friendships). This bonding moment was so unforgettable and one of the happiest days of our lives. We didn’t notice the time until we all stumbled down on the floor powerless and snoring until the breaking of dawn. Watch out for the part 2 of our escapades in Bunga Waterfalls. This definitely looks like a nice place, and you boys sure look like you had a lot of fun. I have a question though, dinamita? Didn't they burn your intestines or something? at first I was hesitant to try .. but when i ate a half of the fried chili , it was nice and delicious ... just right for a chilling weather beside the lake. I did feel a little warming of my stomach but it was tolerable ..
Nice to include the myth of the place here. The lake is really beautiful and really relaxing. I should visit this play as it is just nearby. lol that's why i do not volunteer to prepare the food aside from me being horrible at it, i miss out on doing fun things. i wish i could travel a lot too and discover beautiful places here in the Philippines. The legend of the twin lakes very interesting! 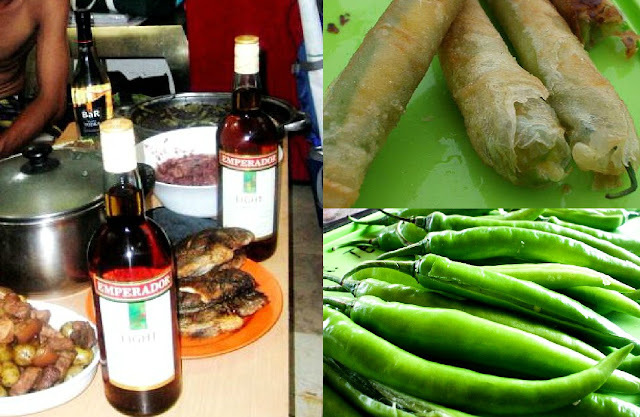 you should try it glen , masarap ! that sure is one fun adventure! hahaha..... ang kulet lang! hahaha.... hope to meet you soon sir! oh my! looks soo fun! I could be one of the boys too! lol!